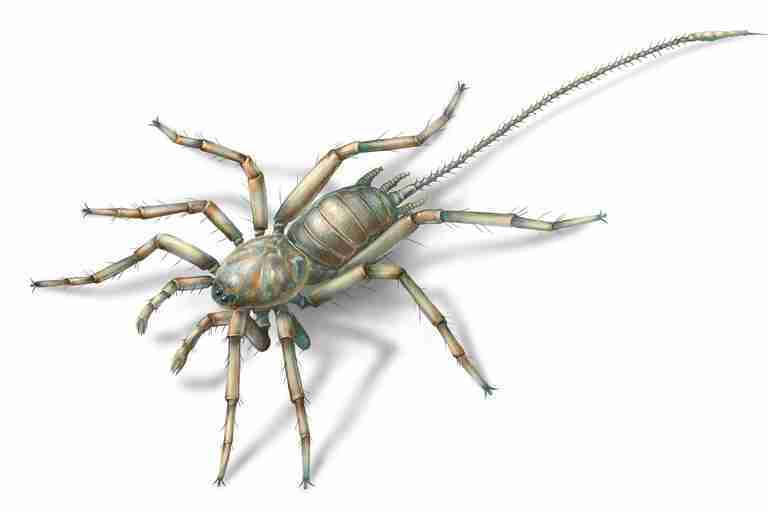 A newly discovered fossil arachnid exhibits an unusual mixture of features, including an ultra-long tail. 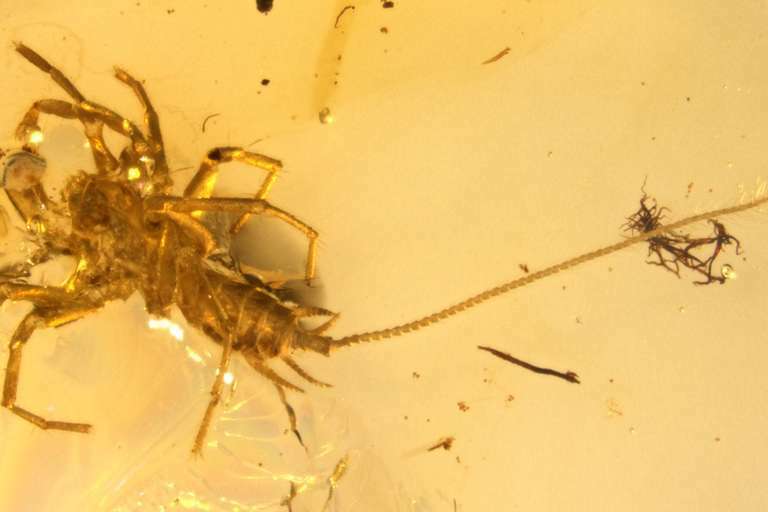 When a fossil dealer showed paleontologist Di-Ying Huang a blurry photo of his latest offering — a leggy creature entombed in amber — the scientist's eyes widened. Despite the poor-quality image, Huang, a professor at the Chinese Academy of Sciences, knew that the specimen was unique. 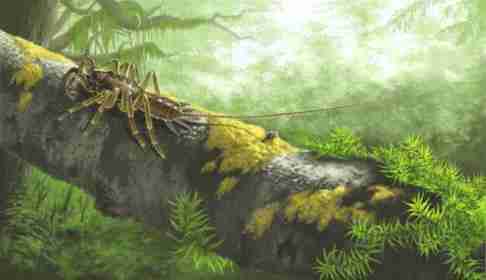 The creature had fangs, 8 legs, and a long tail that was at least twice the size of the rest of its body. The specimen and another piece of fossil-containing amber were acquired for the academy's Nanjing Institute of Geology and Paleontology. Word spread among academics about the bizarre find, and Bo Wang, another professor at the academy, obtained two more similar pieces of fossil-containing amber. Analysis of the four fossils resulted in a scientific rarity. Two independent research teams have simultaneously announced the discovery of a new species, a 100-million-year old arachnid, which has been named Chimerarachne yingi, aka "Monster Spider." Both papers are published in the journal Nature Ecology & Evolution. "The most interesting feature of C. yingi is that it has both a tail and spinnerets," Wang told Seeker. "It is from a very primitive group, and their relatives were present before 250 million years ago." He felt extremely surprised, he said, “because I never imagined that we could find this key fossil from the Cretaceous, only 100 million years ago." "Only" refers to the fact that the arachnid exhibits very primitive features for its age, such as its telson, or tail. The tail resembles that of modern whip scorpions. "Maybe the tail originally had a sensory function," Wang said, "but when spiders changed to lifestyles like being sit-and-wait predators, or having webs, the tail was no longer really needed and became lost." Another early feature of spiders was a segmented abdomen. Most species lost the segmentation over evolutionary time. Like today's spiders, however, C. yingi appears to have been venomous, given what look to be glands for venom production. The arachnid was small — less than half of an inch long — and had six eyes and four pairs of legs. ("Monster" refers more to its unusual mix of characteristics, rather than to its size.) The spinnerets were also similar to those of modern spiders. Spiders began spinning silk much earlier than Monster Spider's lifetime. 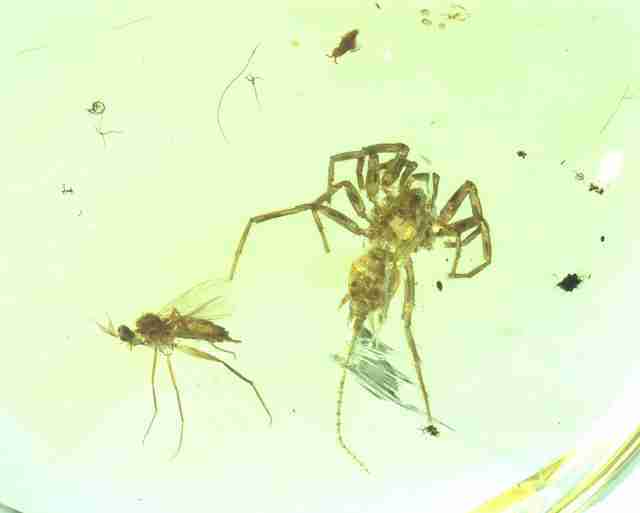 The world's oldest known spider dates to about 315 million years ago. Spiders might have first used silk to wrap their eggs, or to line their constructed tunnels, the researchers theorize. The earliest known spider preserved in amber comes from what is now Lebanon and dates to approximately 130 million years ago. C. yingi, however, hailed from what is now northern Myanmar, formerly known as Burma, an area famous for its amber. 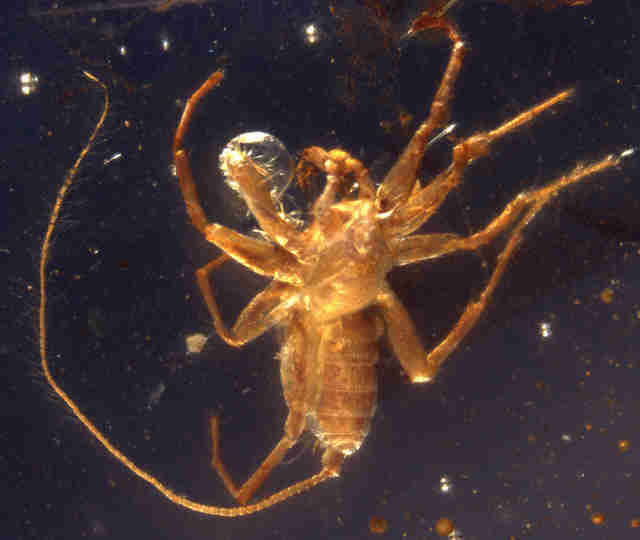 "Spiders are very common in amber," Wang said. "Considering the huge amount of Burmese amber, there are only 4 specimens of C. yingi, so C. yingi is extremely rare." Wang and his team believe that the new species should be classified in the order Araneae, making it a true spider. Wang explained that C. yingi exhibits two key features only present in Araneae: a male pedipalp (appendage) modified for sperm transfer, and well-defined spinnerets. Huang and his team do not believe that C. yingi was a true spider, although they came up with the Monster Spider moniker. They conducted CT-scans of the two other specimens and instead suggest that the arachnid be classified in the order Uraraneida. Huang explained that the order refers to close relatives of spiders that are now extinct. If additional evidence in the future proves their conclusion to be correct, then the fossil record of Uraraneida has just been extended some 170 million years toward the present. This, in turn, would mean that these spider-like arachnids and actual spiders co-existed for a large fraction of their evolutionary history. Additionally, if C. yingi falls within Uraraneida, then organs for spinning silk and the modified male pedipalps are not unique to spiders. Future research could solve the mystery, and reveal more about Monster Spider's behavior. Clues could be the other inclusions within the pieces of amber, which Huang's colleague Gustavo Hormiga from the George Washington University described for Seeker. Collectively, accounting for all four specimens, the inclusions are millipedes, mite nymphs, a beetle, a fly, a springtail, many tiny plant parts, and more. Hormiga said C. yingi likely hunted small insects, and was itself probably prey for centipedes and small animals. Dinosaurs might have even munched on them, either intentionally or unintentionally. The first known feathered dinosaur tail found preserved in amber comes from northern Myanmar and dates to around C. yingi's lifetime. WATCH: What Makes Spider Silk Tougher Than Steel?